With the help of social media, companies now have got a new way to run their online business as it allows them to reach the targeted customers, build personal relationship with them, run ad campaigns to target specific and segmented audience and most importantly build a huge customer base. So if planned strategically the impact of social media on business will be really great. All these together may have positive effects on the overall business, including brand building, sales conversion and customer engagement if applied effectively. But the usage of social media also has some negative consequences which should be kept in mind. It also revealed that, only one amongst five companies has created a policy to follow in its social media marketing activities. You should know properly about the usage of social media otherwise unplanned marketing activities may become harmful for your business. There are several negative effects of social media on business. Being active on most of the social media is undoubtedly very effective for your business what the main concern is the complex process of measuring ROI from all its campaigns. Though it’s a very daunting job, but actually not impossible. For you, it’s important to know how much worth the marketing activities on social media is bringing to your company but it’s difficult to get the exact numbers. There are a number of tools available like Hootsuite, Facebook Insights, Google Analytics, Bitly, Buffer, Twitter Analytics etc. which provide different kinds of statistics to understand the effectiveness of campaigns on several social media channels. You each and every employee represents your brand and It’s very difficult for you to monitor their social media activities, make them understand that on such platforms, they should not discuss company matters without proper authorization. There is a risk even in a social media post related to your company’s predefined objectives, you never know which post can damage your company’s reputation or challenge its assertions to its other investors. This is undoubtedly one of the unavoidable disadvantages of social media on business. Make your employees understand that each one of them is representing the brand and should be aware of the basic do’s and don’ts of social media which may harm the image of your company. On social media platforms, multiple users can interact with a single piece of content (Post, tweets). It is one of the most popular usage of social media with which you can engage with your customers and spread your words to most of the people, at the same time it works as one of the negative effects of social media on business. Social interactions such as re-tweets, likes, comments, shares help to shape your social media marketing activities, but this also can turn against your campaigns if the interactions or comments are negative. These additions will not only reach your followers, but also to the other contacts of users who share, like or comment or retweet it. In this way it will be spread to the larger audience. Actively participate in forums, groups and other discussions to get an idea about what people are saying about your brand. Take the help of ‘Social Listening’ to monitor what is being said about your company. Also known as social media monitoring, it is a process to identify and check what is being said about your company or product or brand on the web. Any statement once released on social media channels circulates at lightning speed, so if you post something by mistake, will be very hard to rectify. Errors like circulating confidential information about your company are nearly impossible to reverse in social media channels. Social media is also a big platform for customers to complain about your products and services. Not everyone will directly contact you for any issues, they may land on your social media company profiles and post complaints or negative feedback/reviews about your offerings. The more complaints you get, the more your brand will suffer. 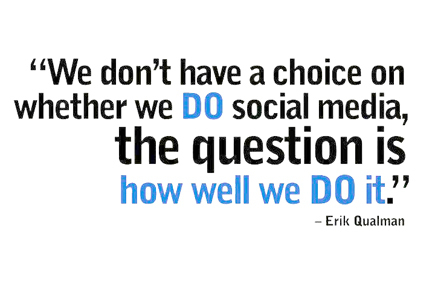 Undoubtedly it is one of the disadvantages of social media for your business. Always remember one thing: each of the negative comment/tweet will have repercussions for your brand. If unable to resolve, forward the complaints to the concerned departments and make sure that customers get the required solutions. One big misconception people have about social media is that: It’s FREE. There are several free or low-cost tools are available, but you have to deploy a substantial about of your time to understand and learn the usage. Time is not absolutely free. Companies who have implemented social media activities on their marketing strategies successfully understand how much time it takes to learn and implement all of them. In social media, the cost per interaction (share, like, tweet) compared to other channels, is practically zero. As information sharing is free and simple, day by day the web is getting crowded with more and more irrelevant information and spams. Altogether, it’s making harder for companies to reach to the segmented audience with valid and informative messages to resonate. Undoubtedly, social media is one of the best way to reach to your target customers, build brand awareness and engage with the users, but to avoid its negative impacts on business, you should know how to handle it professionally rather than using it like that of a school student. Always avoid posting something which is sensitive to your customers.